A rare bird has landed at the University of Michigan: a two-legged robot named "Cassie" that researchers hope could be the forerunner of a machine that one day will aid search-and-rescue efforts. Cassie—whose name is derived from the cassowary (KASS'-uh-WAIR'-ee), a flightless bird similar to an ostrich—stands upright on legs with backward-facing knees. The biped that weighs about 66 pounds (29.94 kilograms) may not have feathers or a head, but she is attached to a short torso that holds motors, computers and batteries and is able to walk unassisted on rough and uneven terrain. 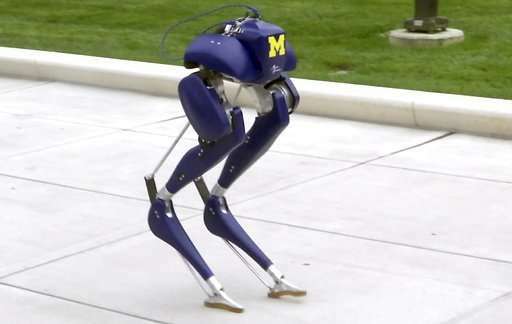 Cassie, which stands a bit over 3.25 feet (1 meter) at full leg extension, was built by Albany, Oregon-based Agility Robotics and purchased by Michigan researchers using grant money from the National Science Foundation and Toyota Research Institute. Although other institutions have acquired similar models, Michigan's team is excited to use its version to put Michigan Robotics' cutting-edge programming to the test, said Jessy Grizzle, director of Michigan Robotics. "This stuff makes our old math look like child's play," Grizzle said. Although there is considerable excitement about Cassie and the potential she represents, certain real-world applications are still a bit out of reach. Search-and-rescue "is a hard problem and serves as a template for 'unsolved problems in robotics,' which is one of the reasons you see it pop up so much when robotics companies talk about applications," said Agility Robotics CEO Damion Shelton, who added that it is "difficult to even speculate" when a robot could be used for such a purpose. Other applications will be launched sooner, according to Shelton, who said a robot capable of walking around the perimeter of an industrial site taking 3D scans is no more than two years away from becoming reality. For now, Grizzle and some of his students are putting Cassie through her paces on and around Michigan's Ann Arbor campus. During a recent a stroll on a pedestrian walkway, Cassie ambled on a grassy, sloped surface, then took a serious tumble and did a face-plant on the concrete. "Well, I think that's the end" of the test, Grizzle said, as Cassie lay in a heap on the ground, slightly nicked and scratched but no worse for wear. The programs Grizzle and his students tested "are version 1.0," he said. "They are simple algorithms to make sure that we understand the robot. We will now focus on implementing our super-cool latest stuff," Grizzle said.